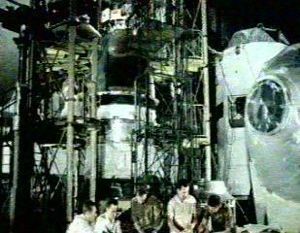 L1 lunar craft in assembly. Note the very extensive equipment boxes above the capsule, and the clear hatch providing entry into the side of the capsule. Is this a 'podsadka' L1? How the Soviet Union fooled the world into believing it wasn't in the moon race. The Internet is alive with web sites detailing Apollo moon landing conspiracy theories. There is almost nothing on the real moon landing conspiracy -- that of the Soviet Union. The Soviet Union had two huge secret projects designed to win the moon race. The L1 project would send a Soviet crew around the moon before the Americans, using a stripped-down Soyuz spacecraft launched by a Proton rocket. The L3 project would beat the American Apollo program to the lunar surface. The Soviets lost both races. In the case of being the first to send a man around the moon, that loss was measured in days or weeks. After the loss, they perpetrated a hoax -- they claimed they had never been in the race to begin with. The Soviet manned lunar programs were only made public after the fall of the Soviet Union. When the participants in the Soviet moon program remembered the program in the 1990's, there was still a 'party line'. The 'revealed' version of the Soviet moon program was that their equipment was never safe enough to launch cosmonauts around the moon before Apollo 8 or land them on the moon before Apollo 11. Yet there were big holes in the 'standard version'. A simple, powerful, and long-known example is found in Kamanin's diary. Kamanin was the commander of the cosmonauts, and the only participant who left behind what are purportedly contemporary diary entries. Kamanin worked tirelessly to beat the Americans in the space race. He worked every Sunday, never took more than a few days real vacation from 1960 on. He attended nearly every key State Commission meeting and launch related to the Soviet manned space program during the moon race. In his diary entry for November 26, 1968, Kamanin identifies the last Soviet L1 launch window before Apollo 8 as December 8-12, 1968. At this crucial point in the space race, his diary entry for 29 November suddenly notes that there is to be an L1 State Commission meeting 'that will consider many fundamental questions of the program' -- but that he will be unable to attend since he has to go to a reunion of his World War II regiment in the Far East (!) The diary entries resume on 7 December, and then only concern cosmonaut center administrative matters, and perhaps retroactively interpolated diatribes as to why the Soviets are losing the moon race. There are similar gaps, inconsistencies, and problems in other participant's accounts. It seems apparent there is something still being swept under the rug. Using declassified US spy photographs, analysis of obscure photographs of Soviet space hardware, reconsideration of declassified intelligence summaries, and much more, Vick and Pesavento propose possible answers. DID THE RUSSIANS ATTEMPT TO LAUNCH A MANNED SPACECRAFT BEFORE APOLLO 8 IN DECEMBER 1968? The direct-launch scenario was obviously simpler and preferred. The two-launch scenario was a back-up, to be used in case the Proton booster was too unreliable to be man-rated in time. The Soviet government authorized production of 19 L1 spacecraft on 27 April 1966: 14 L1's designed for direct-flight to the moon, and 5 L1's designed for the podsadka mission. Similar two-launch scenarios were brought up repeatedly during the L3 program. If the N1 was not thought to be reliable enough, the L3 lunar spacecraft and translunar stage would be put into low earth orbit. A Soyuz launch would follow, bringing the crew up to the spacecraft. Interestingly, both the L1 and L3 were designed for operation by two crew. This was not what the three-seat Soyuz capsule was capable of carrying, but it was the number that would be expected to transfer from a Soyuz in a two-launch scenario. At the first meeting of the L1 State Launch Commission on 24 December, 1966, the plans were still in place for the 'podsadka' missions if the Proton would prove unreliable. The following month Kamanin organised the cosmonauts into distinct training groups supporting either scenario. There was one group training for Soyuz 7K-OK purely earth-orbit missions; one group training for L1 podsadka missions; and one group training for L1 direct-to-the-moon flights. These corresponded to the three Soyuz models then being delivered. In March 1967 all seemed to be going to plan. The Soyuz and L1 had completed their first test flights. Kamanin noted an L1 production and flight plan of thirteen direct-launch L1 spacecraft, designed to fly a Soviet crew around the moon before the 50th anniversary of the October Revolution. No 'podsadka' L1 tests were included in this schedule. However now, for the first time, the first two N1 launches are listed as having 'L1' payloads. These spacecraft were not listed in the original N1 decree. Were the podsadka L1's being diverted to the N1 program? These plans were immediately wrecked by the Soyuz 1 disaster in April 1967. The death of cosmonaut Komarov due to a parachute failure meant that further launch of all L1 and Soyuz variants were delayed pending redesign and requalification of the capsule recovery system. When L1 launches resumed in September 1967, an entirely new pattern emerged. The Proton failed in three of the next four launches up to April 1968. With the American Apollo program getting back into gear after the Apollo 204 disaster, it would seem it was time to dust off the podsadka scenario. However, Kamanin's diaries are silent on revival of any such plans. HOW WAS THE PODSADKA L1 DIFFERENT FROM THE DIRECT-FLIGHT L!? However if the podsadka scenario for the L1 and L3 were considered necessary to beat the Americans, then the Soyuz project and its mission profile makes sense. This profile was for one Soyuz spacecraft to be launched into orbit. A day later a second Soyuz would be placed in orbit only a few kilometers away from the first. The 'active' spacecraft, with three cosmonauts aboard, would activate its Igla system and make an automatic rendezvous and docking with the 'passive' spacecraft. This docking would take place on the very first orbit after the second spacecraft was launched. Two of the cosmonauts would then leave the active spacecraft, and spacewalk to the passive spacecraft. This is exactly what would be needed in the case of a time-critical two-launch podsadka profile for the L1 or L3. The L1 or L3 TLI stages would have cryogenic liquid oxygen aboard which would boil off over time. So a quick rendezvous and crew transfer were vital. After Apollo 8 won the moon race, the Soviets changed to a more leisurely rendezvous procedure involving an entire day of maneuvering prior to docking. But it is clear the Igla automated system was designed from the start to allow a quick docking on the first orbit. Another consideration in all of this is the mysterious L1 'jettisonable support cone'. This appeared in drawings of the L1 made public as early as 1970. This module was known to be carried into low earth orbit, but jettisoned prior to translunar injection. It looked for all the world like a kind of abbreviated Soyuz female docking collar. This would support the idea of some kind of earth-orbit docking scenario. It was stated by some authors that it was only a structural interface to connect the Soyuz capsule with the launch escape abort system. Yet the L1 had a critical weight problem and it would be pointless to carry the 180 kg of extra mass all the way to earth orbit. It was only in 1996 that it was revealed that the cone was used for the electronics and back-up power distribution systems of the SAS abort system. In this case it would be logical to carry it to orbit, and then jettison it after orbital insertion. The L1 capsule was in fact shown to be connected to the abort shroud by four struts aft of the cone. In the late 1990's more drawings and photographs of the L1 were published, and a bewildering number of variations of the support module appeared, often with strange instrument boxes arrayed around the periphery. Vick and Pesavento have analyzed this evidence and propose that the devices were in fact an inflatable curved airlock for crew transfer. The real clincher is the revelation made by the authors that the Yastreb spacesuits used for the Soyuz crew transfers were actually designed for use aboard the L1 (the 'standard version' was that the L1 crews would have flown without spacesuits). This puts the whole Soyuz project completely in the context of the two-launch L1-L3 scenarios. This is again revalidated by a cutaway drawing released in 1996 that shows two cosmonauts in spacesuits in the L1. Using this and many other elements, Pesavento and Vick put together a strong case of additional evidence connecting the Soyuz program with the L1 and L3 programs. They then move on to provide independent evidence of frantic Soviet efforts, not mentioned in any memoirs, to launch both an L1 and a Soyuz spacecraft in December 1968. Studying declassified Corona spy satellite photographs, Vick is able to show that there was substantial unexplained activity at the Baikonur cosmodrome during December 1968. Although no photographs exist during the 8-12 December launch window, images made during a pass on 15 December show a Soyuz spacecraft - booster combination mounted on its pad and the Proton pad gantry in position, although no booster is mounted. A week later, the Soyuz booster is being removed from its pad, but now a Proton - L1 combination is on the Proton pad. This seems to clearly indicate that attempts were being made, right up to and beyond the day Apollo 8 was launched, to beat the Americans to the moon. The authors theorize that an attempt at a manned launch to the moon using the two-launch podsadka scenario was attempted, but that some serious spacecraft problem must have resulted in the Proton launch being scrubbed. With the successful return of Apollo 8 from lunar orbit at the end of December, the race to put a man around the moon was won by the United States. Further manned L1 flights were cancelled as pointless. Yet the Soviets still saw a chance to upstage the Americans before the moon landing of Apollo 11, planned for July 1969. The L3 manned lunar orbiter spacecraft was nowhere near ready. But plans were in hand for a series of N1 superbooster launches with L1 payloads to lunar orbit. In parallel with this robot spacecraft would be launched by Proton boosters to land on the moon. There were two of these robots. The Lunokhod Ye-8 rover would scout landing sites and provide a homing beacon for soft-landing spacecraft to follow. The Luna Ye-8-5 was designed to soft land on the moon, scoop up lunar soil, and return it to earth before the Americans. DID THE RUSSIANS ATTEMPT TO LAUNCH A MANNED SPACECRAFT TO THE MOON BEFORE APOLLO 11 IN JULY 1969? By the beginning of July 1969 the launch of Apollo 11 was imminent and all of the Soviet plans made the previous December to 'answer Apollo' had come to naught. The L1 project was called off after another launch failure in January. The first attempted N1 launch in February had seen the booster ascend into the sky, but fail after a control system malfunction led to all first stage engines being shut down at 68 seconds into the flight. Attempts to land a Lunokhod robot rover in January and a Luna soil return spacecraft in June were both thwarted by Proton booster failures. The last chance was in July. Both an N1 super booster and a Luna robot soil return spacecraft were scheduled for their second launch attempts. The official version was that the payload of the N1 was an unmanned L1S spacecraft that would orbit the moon and return photographs to earth. But according to information published as early as 1974 by former intelligence analyst Peter James, what was intended was a manned mission. The launch of the L1S into low earth orbit would be followed by a manned Soyuz. The spacecraft would dock, a crew would transfer to the L1S, and then be sent to the moon. While the crew observed from lunar orbit, the separately-launched Luna robot would land on the moon's surface and then return lunar soil to the earth. This amounted to nothing less than the revival of the 'podsadka' L1. Pesavento and Vick show that several writers with access to US intelligence sources were describing such a scenario in the early 1970's. This was intriguing since the existence of an L1 podsadka variant was completely unknown in the West until 1995. In the event, the N1 rose only to 200 m when all of the engines but one shut down. The SAS abort system functioned, the escape tower rocketed the Soyuz capsule away from the rocket 'into the darkness'. The rocket slid back to earth and exploded in an enormous fireball, equivalent to a small nuclear bomb, destroying the pad. If there were cosmonauts to be launched in July 1969, who were they? Kamanin has a June 18, 1969 diary entry indicating lunar landing cosmonaut candidates as Leonov, Bykovsky, Voronov, Khrunov, Yeliseyev, Makarov, Rukavishnikov, and Patsayev. Vick and Pesavento attempt to account for the whereabouts of the cosmonauts at this time (there is good information on this since American astronaut Frank Borman was visiting Russia and touring space facilities in the Moscow area in the week prior to the launch attempt). They conclude that Gorbatko, Bykovsky, and Khrunov are the most likely cosmonauts, and also place Leonov, Makarov, and Kuklin at the cosmodrome. (Leonov may be considered unlikely, since he was on a tour to Japan just the month before - where he got in trouble by not following the moon hoax party line and told reporters 'both manned and unmanned lunar spacecraft are in preparation and that lunar rocks will be returned by Soviet spacecraft by March 1970!'). Khrunov reportedly told Vick that he was at the launch and 'that he had wept soon afterward, realizing the race was over.' Would this be the reaction to a launch of an unmanned test vehicle? In any event, the explosion meant any launch of a crew to man the lunar spacecraft in low earth orbit was cancelled. Officially, the Soviets pressed forward with the prepared line: They had never been in the moon race. They had no program to land men on the moon. They would never risk the lives of Soviet citizens in such a dangerous exercise when robots could do the job just as well. This was swallowed by the Western media. Walter Cronkite gravely informed the American people in the 1970's that the money spent on Apollo was wasted, since the 'Russians had never been in the race after all'. A few voices, notably that of Charles Vick, analyzed scraps of information that were inadvertently released by the Soviet censors and tried to make the case that there was an enormous, hidden, Soviet moon landing program. It was only with the collapse of the Soviet Union that part of the real truth finally came out. They were in the race. And they had lost. But only now have Vick and Pesavento shown how truly close they came to winning.